The FlyPack 9000 connects to camera via dual HD-SDI link or optional optical fiber cable to create a convenient, portable full-bandwidth 4:4:4 (RGB) image capturing system with TC, LTC, Genlock, RS422, RS232 support. 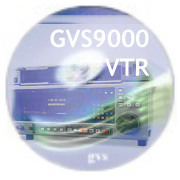 The 9000 can also be configured with the VIPER or HDWF900 HDCAM camcorder to record HD 4:2:2 component images.The 9000 processor unit provides a variety of video-processing functions and houses an array of input and output connectors, including HD/SD signals, 8 channels of digital audio, and 8 channels of analog audio. The 9000 functions include 2-3 pull-down insertions for 525 down conversion, and RGB 4:4:4 to Y/Pb/Pr 4:2:2 color space conversion. The system is capable of operating in a number of recording modes: • SD (standard definition) providing 4:2:2 uncompressed as well as DV QT files, at the same time in both 4:4:4 or 4:2:2 • HD (High Definition) mode allowing for one high definition uncompressed recording while it creates identical footage with the same time • DVCProc HD with uncompressed ratio in full band RGB 4:4:4 • and a mode where two separate 4:2:2 HD SDI inputs can be recorded simultaneously to the same storage RAID. 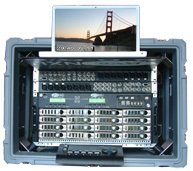 This provides an efficient means of recording stereo full bandwidth 4:2:2 images for 3D productions. Each stereo channel is recorded at full uncompressed media with the benefits of full error correction to both channels. Designed to fit seamlessly into a high-resolution production workflow, the FLYPACK 9000 offers a Virtual Tape capability that allows users to incrementally move to a digital disk based workflow. With this digital disk based technology, the FLYPACK 9000 provides a single flexible platform for all your content production from live and post production applications. FLYPACK 9000 picture becomes available to editors in the background automatically as the recording progresses. Sports recording, News, Telecine, Video/Audio Post and much more. 9000 offers options including Audio LTC capture, 9-pin deck control and VLTC. It also includes XML Clip capability allowing operators to mark subclips on the fly for instant import to FinalCut Pro as short subclips of the recording. FLYPACK 9000 offers excellent performance, superb integration with a variety of systems, and enables cost effective electronic transfer of high-resolution masters. Beginning with capture – via telecine, direct from digital camera, tape or direct to disk animation – 9000 technology records an exact copy of the original content. Throughout the post process, from color correction to DSR, editing, effects, audio processing finishing and optional down conversion for distribution in real-time. 9000 offers Pre-Read recording uncompressed 8-bit/10-bit option offering non-destructive pre-read and post-read functions. Pre-Read (where the HD SDI signal is written to the disk, and up to 5 seconds after it's written, you are able to playback) allows a 2nd read head to function using the same content during recording to playback. The playback can be activated with TCP/IP, RS422, or GPIB Input. 2XU is also able to do synchronized playback with Audio. • Capture live event and audio LTC into time stamped native QuickTime movies. • Movies are available for instant playback or editorial while still being recorded, feeding slo-mo replay via network or fiber. • Supports multiple records, Playback and FinalCut Pro editorial channels. • Audio Post recording time stamped Quick Time movies, with instant availability of picture to networked clients. • RS422 machine control for programmed ingest from videotape, or from real-time output of picture editorial system. • Movies are available for immediate playback while still being recorded. • Fly Pack 9000 capture can feed multiple edit systems. • Long form production saves hours of transfer time between Picture Editorial and Audio Post. • Eliminates tape transfers using real-time technology without rendering video effects to disk. • Saves HOURS of transfer time per hour of material, allowing video/audio post to immediately start working against new cut, while it is printed from picture editorial system. Start editing in Final Cut, Avid, After Effect, and many other software and hardware product lines. Using visually loss less, highly efficient quality encoding fiber based shared image storage the 9000 provides the most accurate digital replica of your projects available today. Support for 24, 25, 29.97, 30, 48, 50, 59.94, and 60 frame images, progressive, interlaced and segmented frames, allows you to work with images at their native resolution and frame rate. With this introduction, 9000 provides the best platform for cost effective video production and post production as well as 4K digital intermediate to come.